May 23, 2017 - By Chris Britton -Target is a great place to shop. I love going there, and I bet many of you do too. But I also find the company fascinating because over the past few years it has provided huge debating points for those of us who make a living managing issues and crises. Until United Airlines recently showed how to turn a crisis into a disaster and created learning points for years of lectures, Target’s handling of its 2013 data breach was the poster child for “what not to do in a crisis” workshops. More recently, and a little less clear cut in terms of best practice, Target has been in the spotlight ever since it published a blog post in April 2016 welcoming transgender employees and customers to use the restrooms and fitting rooms corresponding to their gender identities. The noise and smoke created by the United crisis management fiasco, and the subsequent issues faced by other airlines, obscured a more interesting and potentially even more damaging source of reputation risk that became visible in the same period. RESTON, VA - (April 19, 2017) - RockDove Solutions, the developer of the In Case of Crisis mobile app, has created an infographic detailing how organizations can determine if their disaster recovery plans are sufficient for whatever crises might come their way. The infographic, Audit Your Disaster Recovery Plan, can be viewed at here. March 16, 2017 - By Chris Britton - The President of the United States just called out your company in a tweet. Your world is rocking and everyone from customers to investors want to know what you are going to do. It’s an experience shared by an increasing number of companies. Just ask Nordstrom, Lockheed Martin and Amazon, among many others. August 10, 2016 - In today’s environment, organizations need to be prepared for a growing number of unpredictable situations. For The Boston Globe, whose 800,000 square foot headquarters operates 24 hours a day, 7 days a week, making safety plans easily accessible on mobile devices at anytime to more than 700 employees is a critical task. August 4, 2016 - By Eric Holdeman - Having grown up in the paper era (note I did not say "papyrus") I still have a fondness to hold something tangible in my hand to read. But that phase of history is rapidly going away. Now today you can have your entire organization, public or private, have access to the plans, procedures and contact information that they need to respond and recover in an emergency. The day of the wallet card; notepad; three ring binder is almost gone — for those willing to invest money in being prepared. August 4, 2016 - Reston, VA - Celebrating a three-year partnership, RockDove Solutions announced today that The Boston Globe has renewed its use of its crisis management solution In Case of Crisis. 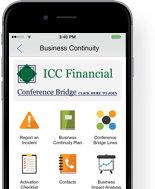 The mobile app makes step-by-step guidelines for how to handle weather events, medical emergencies, workplace violence and other crisis scenarios available to employees on their smartphones and desktop devices, turning plans into digital playbooks for more than 700 employees. July 28th, 2016 -Today, retail loss prevention’s focus has grown from preventing the loss of inventory within a retailer’s stores to a variety of other activities ranging from HR challenges, crisis management, emergency situations and disaster recovery. However, the process for communicating emergency preparedness procedures with employees has remained stagnant. This could result in a tremendous loss in operations and profit for retailers. With brick-and-mortar retailers fighting for every dollar against growing online and mobile sales, empowering employees at each store location to protect assets has now reached a critical level. June 14th, 2016 - When a crisis occurs, it is paramount that organizations offer affected parties clear guidance on how to mitigate the many related risks. Surprisingly, the Institute for Crisis Management reports that only about half of organizations worldwide have a crisis plan in place. For those that have taken the time to develop a plan, they must be executed swiftly and strategically because the longer it takes to communicate specific directions, the more likely it is that a situation could escalate. Also, the longer it takes to address a crisis, the longer it will take to end it. This could mean more delays, and more lost revenue, before business can resume.